I dug some tilapia fillets out of the freezer. I bounced out to the garden to pick some fresh parsley from the garden, thinking I was going to do the same old Lemon-Dill Tilapia thing (that’s my fall back for when I’m feeling uninspired)…but of course, I opened the fridge to grab the lemon juice…and the garlic bulb practically jumped off the shelf! 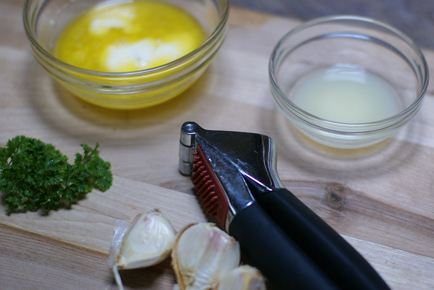 Parsley, lemon juice, garlic…Scampi, of course! 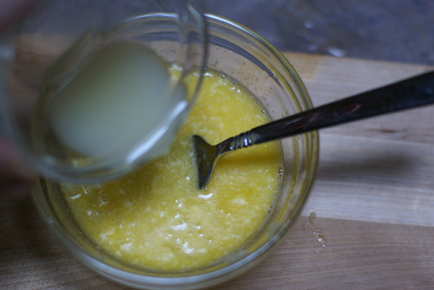 Snatched the butter (dairy-free margarine, really) and off I went to make a little something to pour atop the tilapia fillets. Ended up being fairly simple. And oh my heavens, tasty too! Cook the brown rice as directed on package. 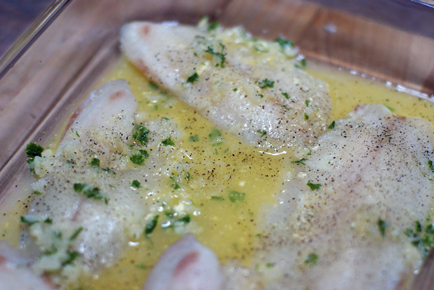 Put the tilapia fillets into a greased, glass baking dish. 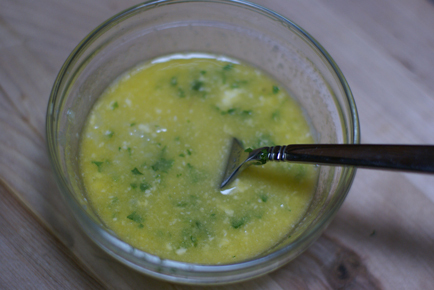 Crush the garlic and add to the melted butter with the lemon juice and chopped parsley. Pour over the fillets. Season with salt and pepper. Cook the peas as directed on package. 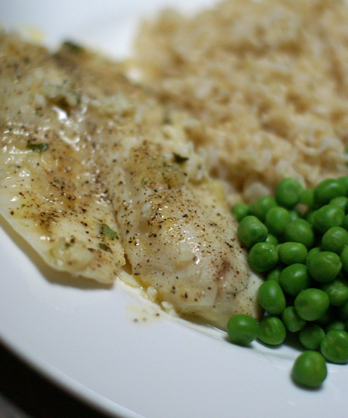 Serve Scampi Tilapia Fillets with Brown Rice and Peas. Your fish looks delicious. I am always looking for new ways to prepare fish. Thanks. And thanks for the linky. This sounds delicious and I love that it is so simple. That sounds yummy! What brand of dairy-free margarine are you using? I need to find one because one of my kids is about to start an elimination diet. I use Smart Balance with Flax Oil. It’s dairy free. And the cheapest that I have found too. Just the inspiration I was needing! Spent the day at the pool and I wanted something easy and light – found tilapia in the freezer and came to your website! I did have to substitute couscous and steamed green beans! Thanks so much for the delicious recipe! thanks for the recipe! I ruined my last tilapia dish..long story..so I’m excited about this easy one! oh my gravy that looks SOOOOO good!!! gonna have to go buy some fish to try it. Thank you for this Talapia recipe! I was just wondering how I was going to prepare my fish for tomorrow’s dinner, when I found your post! I can’t wait to try it! Does tilapia have bones you need to be concerned about? No bones in the tilapia fillets I buy! I cooked mine from mostly frozen. I had it thawing for a bit in the fridge. I do a similar tilapia using Johnny’s Great Caesar Garlic Spread and Seasoning (huge jar from Costco). The kids love it. Thanks for posting this. I’m always looking for new ways to prepare fish. I made this last night for supper, it was fantastic!! Thanks for the recipe!! super easy had it for dinner last nite. delicious and healthy.